My favorite events are outdoors… especially if there’s dance music. 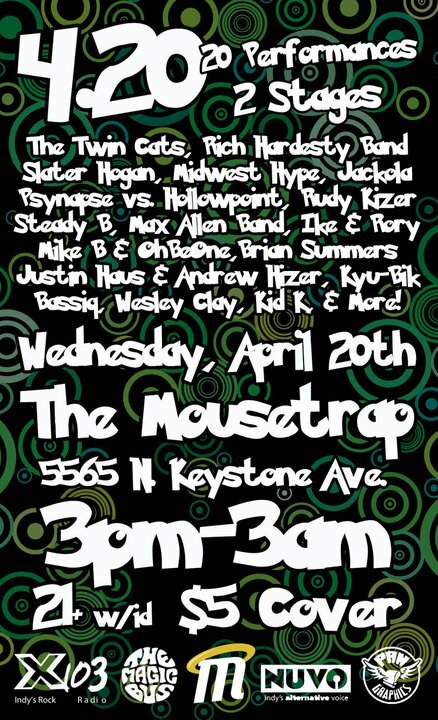 Needless to say I’m pretty excited to play in a big tent this April 20th for IndyMojo’s Annual 4/20 party! With 2 stages and 20 acts (bands inside, DJs outside), this is definitely one not to miss! NUVO Nightlife Guide Release Party! Come check out the release party for NUVO’s 2011 Nightlife Guide at Tru Nightclub! I’ll be in the upper floor spinning alongside Action Jackson, Matt Allen, Indiana Jones, OhBeOne, A Squared, Twinpeaks, and Helicon. PLus down in the lounge check out Kodama, Uzo, Stylistic, and Jamestown!